The big, much restored church dates back to the C13, but is mainly C14 except a C15 two-storeyed north porch. The C16 font-cover has opening doors. 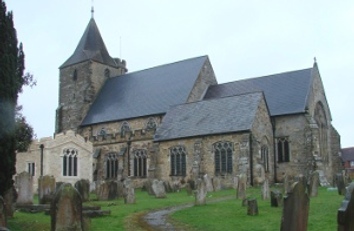 Like Wadhurst, Ticehurst was an important centre of the mediaeval iron industry and the similarities between the two churches, both predominantly C14, are considerable. The aisles and the arcades at Ticehurst are mostly C14, but the heightened west walls show there was an earlier aisled church, which was probably C13. Their replacement within a century may be the result of structural problems, for the south west bay of the present arcade was rebuilt again later (see below). Though the arch of the north porch has been seen as re-used C13 work (BE p612), the detail looks C15 like the rest. 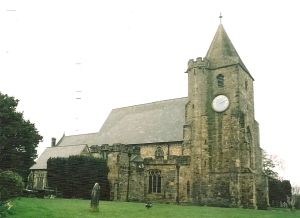 Nothing else of the C13 remains except, perhaps, the groundplan with a tower, four-bay nave, chancel and chapels. The C14 tracery is exceptional by local standards, despite considerable and in some cases debatable restoration. The big segmental aisle windows have teardrop shaped reticulations; the heads in the north aisle are flatter and both aisles have ogee-headed west lancets. The south chapel windows are like those in the aisles, except for the east one, and the Sharpe Collection drawing (c1797) shows similar ones in the north chapel, though that was rebuilt in the C19. Doubt centres on the clerestory with three pointed openings on each side with tracery in the style of the earlier C14. On the Sharpe and the Burrell Collection drawings (1786) the openings resemble the aisle windows, whilst in 1852 Adelaide Tracy (IV p57) shows smaller plain openings within the main ones, so alterations after 1797 are likely. W Slater, the restorer in 1855-57, claimed (Eccl Dec 1855 p392) that he reinstated the tracery on the basis of original springings he found. The windows in the C18 drawings do not look post-Reformation, so probably Slater misinterpreted what he found, though the effect is undeniably remarkable. In 1863 Sir Stephen Glynne sounded unconvinced, when he noted that they had been restored ‘according to what seems to be the original design’ (SNQ 16 (Nov 1967) p349). 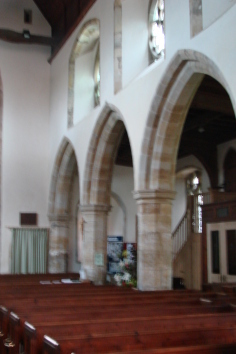 The arcades and chancel arch are more straightforwardly C14 with octagonal piers and double-chamfered arches, whilst the roof has crownposts. Inside, the lower stage of the tower of c1370 has a tall arch with semi-octagonal responds and externally it has angle-buttresses, a three-light west window and a moulded doorway with head-stops. Though retooled in 1856 (ESRO Par 492/4/30), the tracery looks original. The upper stage is of a different stone, so construction may have been interrupted. It has single trefoiled openings and a squat broach spire. Unusually, the eastern parts appear later, for although the chancel was largely rebuilt in the C19, the Burrell and Sharpe drawings show the work was done accurately. Thus the east window of the chapel has panelled tracery, like the five-light one of the chancel. The main mullions curve inwards and cross, indicating it is not later than c1400, like the long square-headed side windows with pierced spandrels. The chapel-arcades and arches into the aisles resemble the nave arcades and suggest the rebuilding was a single project, though spread over 30 or 40 years, whilst the roof timbers in both chapels (those in the north chapel were presumably re-used) recall those of the nave. By about 1400 the church was substantially complete. A two-storeyed north porch was added in the C15, similar to others in the area. 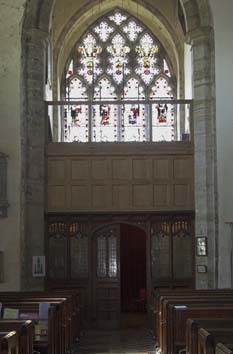 Above the arch is a canopied niche and a window for the upper chamber, which is approached from the north aisle by a wooden stair to the massive door. This is original, including the lock. The vaulted lower storey has hollow-chamfered ribs springing from defaced angel-corbels and the centre boss bears the arms of Etchingham (VCH 9 p256). The battlements are like those on the aisle and are part of the original design, whereas those on the south aisle date from 1902. The reason for the greater elaboration on the north side is that this was the main approach, as the presence of the porch confirms. 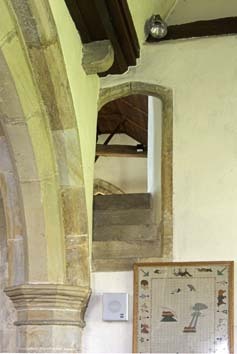 Also C15 is the stair to the rood-loft, of which the upper opening is north of the chancel arch. Probably in the early C16, the south west arch of the arcade was replaced by one largely resembling the C14 work, but slightly four-centred, with rougher chamfers and broader and shallower mouldings on the respond. The clerestory opening above may also have been altered. Apart from the clerestory and the previous general dilapidation, the Sharpe and Burrell drawings show little has changed today. The C19 restorations are poorly documented, e g as already noted the alterations to the clerestory after 1797, and the identity of the unnamed architect who is said to have restored the chancel (Eccl Dec 1856 p458) before Slater came in 1855. Whoever he was, most of the exterior was rebuilt and the inside was heavily scraped. Slater restored the nave, aisles and tower and followed what he found or, as with the clerestory, believed he had. Apart from the latter most work then was inside and in 1861 (CB 7 p734) repairs to the exterior were in progress. As Slater was active elsewhere in the area throughout this time, he may well have done this and the detail was renewed accurately. If not done already, the north chapel was rebuilt then on the old lines (Langdon p142). 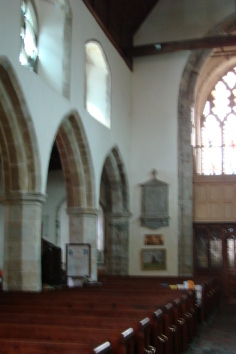 A post-restoration engraving in the church shows the chancel arch lower than today, though otherwise similar. It was heightened during further anonymous work in 1880 (CDK 1880 pt 2 p163). In 1902 £2000 was spent on the nave (BN 82 p698), including the addition of the battlements on the south aisle. The architects were W O Milne and J C Hall (ICBS). 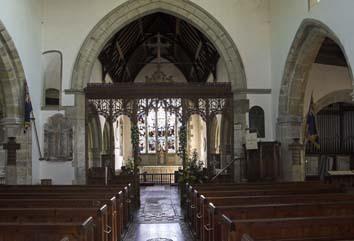 In 1906 W D Caröe (BN 91 p541) restored the chancel again. There were repairs to the roof and walls in 1970-77 by J D Clarke and Son (under D Clarke) (ICBS) and in 2009-10 the same practice (responsible architect R Crook) (information from the churchwarden) added an extension at the western end of the south aisle (known as St Mary’s Room), in a style related to that of the church. It is entered through what was the south west aisle window and a similar one now forms the east window of the extension. Though the stone of which it is built is still very bright, it will weather. Altar: (North chapel) G H F Prynne, c1921, a wooden chest with a traceried front that is now lacking its riddel-posts and other original features (www.gfp.sharville.org.uk). Brass: (North chancel) John Wybarne (d1490) This consists of a figure of a knight of c1370-80 of the B Series (see London workshops) with a long sword, flanked by smaller late C15 ones of his two wives, which are of rougher workmanship. The will of his second wife, Agnes, of 1502, enjoins her executors to find and use a suitable stone as a monument, though she may not have expected her wishes to be interpreted in this way. The brass was found under the floor in 1855 (Mosse p147) and one wife was stolen in 1980. Choir stalls and lectern: The lectern bears the mouse emblem of R Thompson of Kilburn; so do the stalls (in four places), but these are exceptionally well hidden. They were made in 1961 and 1964 respectively in his workshop, after his death (J Thompson p82). This may explain why they are smoother and more classically derived than is usual for this workshop. Font: C15 with a plain, octagonal bowl. 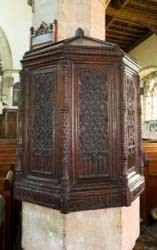 Font cover: Early C16, fitting over the whole top of the font with opening doors and a low conical top (see also Sedlescombe and Rotherfield). Each side is carved with varied flamboyant tracery. There is an illegible inscription around the base. 1. 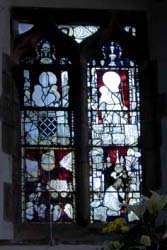 (North chancel and north west aisle windows) Substantial remains of C15 glass, from the east window, showing a Virgin and Child and a Doom (Le Couteur p57). Among the figures are a pope (in a tiara) and a king. Plans in 1856 for J Powell and Sons to re-arrange the surviving glass in the east window were unfulfilled (1 p28), but there is a reference in The Ecclesiologist (Dec 1856 p459) to work by them on the ‘chancel windows’, so they may have reset the mediaeval glass in its present positions. 2. (South aisle west window, north chapel east window (two lights) and north aisle west lancet). J Powell and Sons, 1856 (www.stainedglassrecords.org, retrieved on 16/2/2015) and probably connected with their work on the mediaeval glass. The glass in the north chapel consists of quarries and the two aisle west windows contain heraldic glass. That in the north aisle contains, unusually, the Royal Arms (see also below). 3. (Chancel south window) This contains two barbarously treated ‘pickled’ figures, which are said to have belonged to a window designed by H Holiday in 1875, made by Heaton, Butler and Baine (www.stainedglassrecords.org retrieved on 29/3/2013). However, it is most unlikely at this time that Holiday would have produced glass for anyone but Powell’s, so they were more probably the authors. (Thanks to Nicholas Antram who drew my attention to this). 4. (East window) Probably by Lavers, Barraud and Westlake, 1878-79 (Suggestion of Peter Cormack, noted in www.stainedglassrecords.org retrieved on 29/3/2013). It commemorates M Holgate Foster, who has been given as the designer, though she is otherwise unknown (BE(E) ibid). The central panel is said to have been exhibited at the Paris Exhibition in 1878. 5. (Formerly, south aisle, third window, now in east window of extension), designed by C Whall, 1890. According to Peter Cormack, it was one of the first of his windows in which he was involved in the manufacture (Boston, Mass p11), though it was made by J Powell and Sons (Order book). 6. (West window) J Powell and Sons, 1891 (ibid), comprising figures set in plain glass. The designer is not known and it is in poor condition, though by the date of its manufacture glass-makers like Powell’s were generally technically competent. In this case, one face has been completely repainted (that on the right when facing west) with the portrait of a much loved vicar of the earlier C20 (information from the churchwarden). 7. (South aisle, fourth window) Clayton and Bell, c1898 (WSRO Fac). 8. 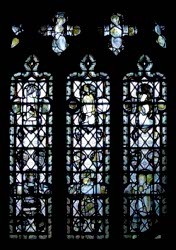 (North aisle, first window) J Powell and Sons, 1912, designed by —- Read (Hadley list). 1. (South chapel, concealed beneath carpeting) Undated iron tomb-slab, with the arms of the May family. 2. (North chapel, east wall) George (d1714) and Albinia (d1717) Courthope. Cartouche by T Green (Roscoe p553). 3. (North chapel) Related monuments to Sir George Courthope (d1642) and another Sir George (d1685). in fact the pair probably both date from the 1660s. Both have alabaster frames which differ in detail and have been attributed to Joshua Marshall (BE(E) ibid). Pulpit: Designed by Slater, 1856 (ESRO ibid). 1. (North chapel) C19, incorporating small C16 or C17 carved Flemish panels. 2. (Chancel) Mostly painted, designed by M Travers, c1947 (Warrener and Yelton p322). Royal Arms: (North aisle, west lancet) Unusually these are in stained glass, 1856 (see above). They are a late example and thus show the current Arms. Screen: c1914. Though tentatively ascribed to G H F Prynne in the website on this architect (www.gfp.sharville.org.uk), mainly on account of the similarity of the detail to his known work, it was in fact made by F Rosier (information from the churchwarden), whose use of gothic detail is characteristic. Squint: (Between south chapel and chancel) Almost certainly C14. My thanks to Nick Wiseman for the photographs of the fittings and glass and also that of the interior of the chancel.